Despite our main target in developing Locus Map is its intuitiveness, the mobile app has become such a complex piece of software over the years that the necessity to create some kind of its complete knowledge base seemed inevitable. This necessity was saturated gradually during the app development by writing articles here-and-there about recently added features – however, such approach resulted in the end in a quite messy mix of texts which were partially unfinished, partially obsolete etc. In the end of 2014 we decided to rework the knowledge base from the scratch. It wasn’t easy but during this year we finally managed to create a brand new, logically structured and clearly written information base that hopefully meets our and your needs. It is divided in two directions: by the approach towards the user – from the very beginners to the most advanced ones, and by data areas that Locus Map works with – maps, tracks and points, including thorough and detailed description of all settings, functions, tools and add-ons. All that in three languages, English, Czech and German that was finished recently. Entering part of the knowledge base is, of course, dedicated to a brief introduction to the app, what it can be used for, where to get it, download and how to control it. It contains large screenshots with brief descriptions written in easy style. It mentions also some headline features like track recording or navigation. Obviously, it is densely linked to the main part – detailed User Guide. … or FAQ were given their dedicated part right after the basics. Firstly, here you can find answers to your questions about solving problems, best ways of contacting Locus team or how to help with Locus Map development – user feedback is very important for us and it’s one of the foundation stones whole Locus Map development is built on. maps are essential – options of their display, downloading to offline, management and finally description of all tools that can work with them like e.g. calibration or overlays of more map layers. Locus Map as an outdoor navigation app works with tracks and points – each category has its own large part regarding management, creating, import and export of these data and, of course, main features like e.g. route planning and track recording. Despite Geocaching works with points – caches – it was dedicated an individual part as its topic is also very comprehensive. Here you’ll find out everything about geocaches import into the app, their management, online, offline logging options and about useful tools for their paperless hunt. Locus Store is a place where you can fetch the maps you need. And not just them, also navigation voices or various user graphics like cursors or icons are available here. In this part you can find all about our virtual currency LoCoins, about your user profile and product purchase. Other functions adding further features to the basis given by maps, tracks and points are described in detail in another part. Information about search, parking, weather forecast, live tracking and much more can be found right here. Add-ons and cooperating apps – Locus Map offers loads of functions but not everybody can utilize all of them therefore many features can be added by additional installation of add-ons. Not all of them come from our dev department, however, all of them work flawlessly and in this part you can find everything about them. 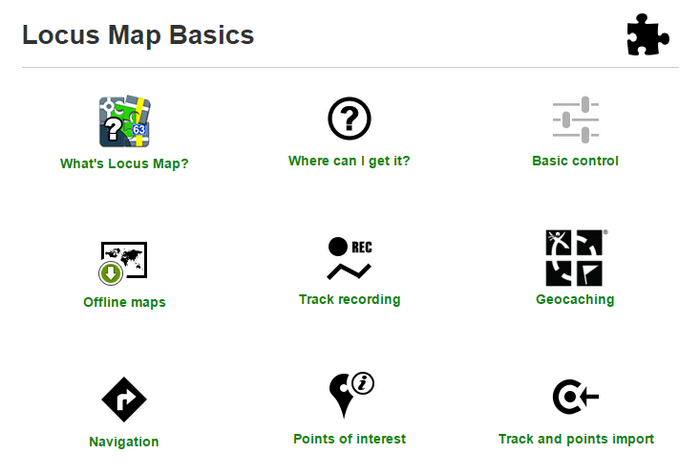 Tools enable to enhance Locus Map features even further. Would you like to transform Locus into an unprecedented cyclocomputer? The Dashboard tool can make it for you. Do you need to manage external devices connected with Locus over bluetooth or ANT+ interface? Here you’ll learn how to do it. The last part covers areas even beyond Locus Map app framework. It deals with methods of various custom data preparation, creating custom maps, damaged database repairs or development of your own Locus add-ons. As these advanced chapters regard quite expert aspects of Locus Map and its environment, we assume certain IT experience can be useful for their correct understanding. Despite we did our best to structure the knowledge base logically and clearly it can happen that you won’t find what you seek in such a quantum of information. The fultext search is a sure thing and you can find its tab both on the title page and in the header of all other pages. We believe the new knowledge base will contribute to even better use of numerous features Locus Map offers and you’ll enjoy it!